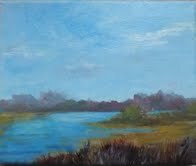 Dr. Gail Burke lives in West Dennis, and her exhibit Painting the Town focuses on landscapes in the Dennis Villages. It will be on display through June 29th. Come in to see how your village is pictured! There will be a public reception at the library on Friday, June 7th from 5:00 to 7:00 p.m.
Gail, a member of the Yarmouth Art Guild and the Morning Muse, has been active in the arts since childhood. She serves as Chair of Educational Outreach at the Cape Cod Museum of Art. Dr. Burke was an educator in schools, colleges and adult learning venues- teaching, writing, and integrating the arts in creative expression. There will also be an ongoing raffle: those who can identify the locales in the paintings and those who submit an entry, identifying the settings of certain scenes, will have the chance to win a print of one of her paintings.